For my first experience at the famous MDS&W, I think I managed to behave myself pretty well. =) We got there a little bit too late to snag any of the Koigu Mill Ends or the Socks That Rock, which was a bummer, but there was certainly plenty of other great stuff to keep us occupied. My first purchase was at The Fold. 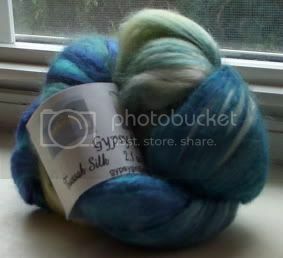 I picked up some Blue Moon Fiber Arts Merino/Tencel roving in “Dutch Canyon”, which is just gorgeous. This picture doesn’t really show the shine on this stuff (it’s stupid and rainy here today), but this one shows it pretty well. For most of the rest of the day, we just wandered around petting things and drooling. We met up with the too-adorable-for-words alerievay for lunch, and had a great time gabbing with her while munching on some very yummy food. Valerie and I had gyros, Jen had a fabulous looking lamb stew in a bread bowl, and hubby had lamb barbecue and a lamb kebab. And although we skipped the deep-fried Twinkies (despite being strangely tempted), hubby and I did each (*blush*) have one of the amazing HUGE chocolate eclairs from the same stand. 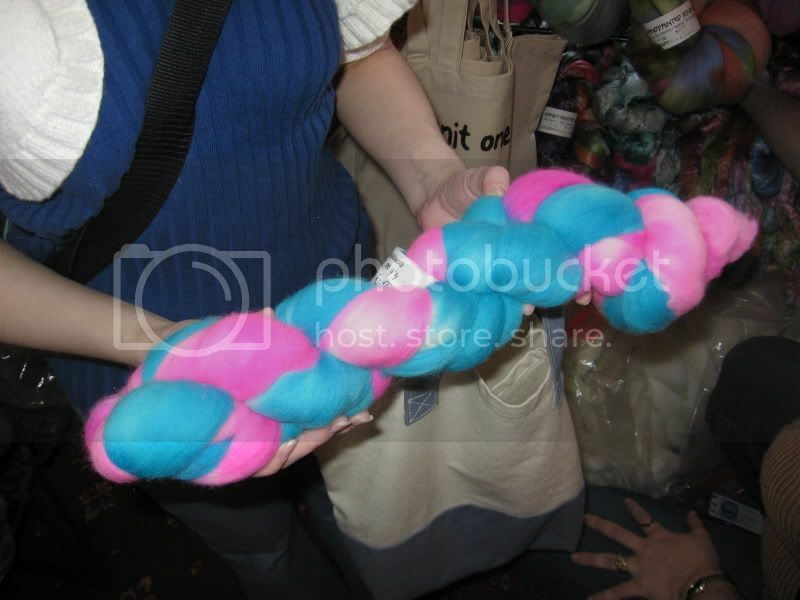 My final purchase was some lovely roving from the Opalessence booth. It’s green from a distance, but when you get closer, it actually has a lot of other colors running through it. I can’t wait to see how this spins up. The only bad thing about the day was that I got a little sunburned on my back. Nothing horrible, just enough to be a little itchy today. I really had a lot of fun, and I think Kris even enjoyed himself. I know he certainly got some great pictures. 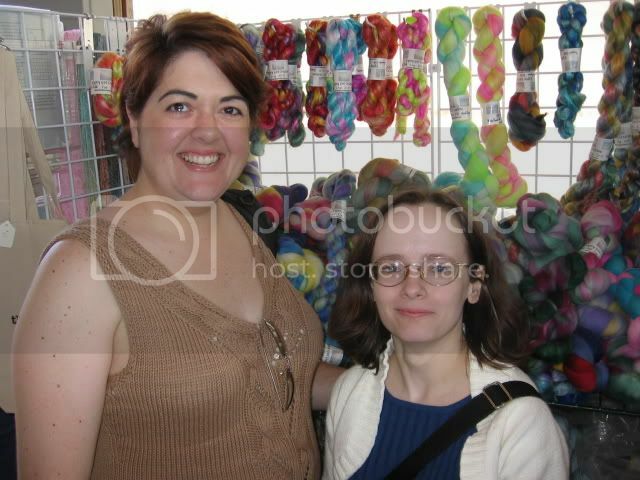 I’ve got a slideshow of them over on Photobucket, or the full album is here. Oh, and I almost forgot – Saturday was the official debut of my Prosperous Plum Tank! And the matching bolero! So, a modeled shot of the tank here. It’s not perfect, but I’ll see about getting a better one later, along with a decent one of the bolero. 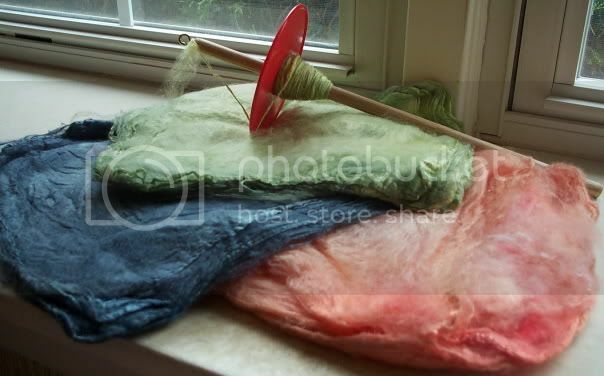 May 8th, 2006 | Tags: Fiber, MD Sheep and Wool, Spinning | Category: Misc. I said the exact same thing about the STR and the Koigu! I understand that all went pretty quick. I love those photos! Kris did a great job! It was so great to meet you all! Beautiful purchases! 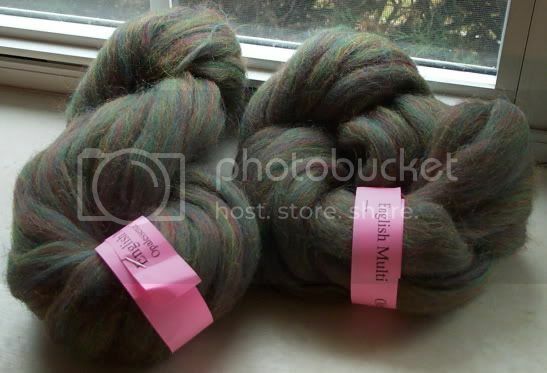 I didn’t even imagine that BMFA made roving, or that Koigu offered mill ends! It looks like a great time, well based on the purchases. You know your the first person to mention the food, now I know I’ll have to go some time in the next few years. Wait – Socks that Rock sold out by Saturday afternoon??? Wow! 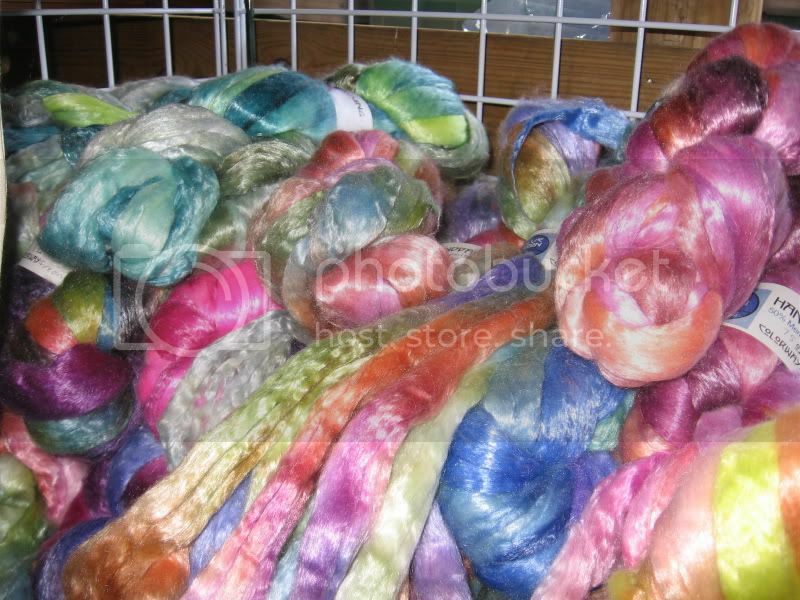 I got to the Fold Sunday late morning, and they were almost out of their dyed rovings. 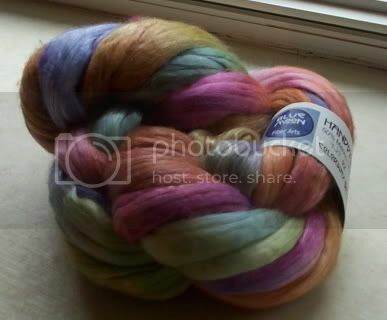 I haven’t posted my yarn p0rn yet from S&W, but I was bad! As I was saying, the tank looks amazing on. The fit looks great! Heehee, I’m in one of your pictures! Not that anyone could tell. In the competition fleeces pic, way off to the right, I’m the small yellow t-shirt blob behind the guy.